WSP has a strong track record in systems thinking and the use of System Dynamics modelling as a way of representing and exploring complex system change. We believe that these tools, and the skills to use them, are best fostered and deployed in a way that is embedded in the strategic change process. Over 30 years of combined experience in the WSP team has been brought together into our good practice guide. If you want to see what a system dynamics model looks like at the end of one of model building processes then you can view a number of examples on our model hosting page or on Isee Systems Exchange site. 1. Conceptualisation basically means a bit of a brain-dump and is often a very creative process. In complex systems that range across organisational boundaries this stage often generates learning and a new insights into how the system works (or doesn’t). 2. 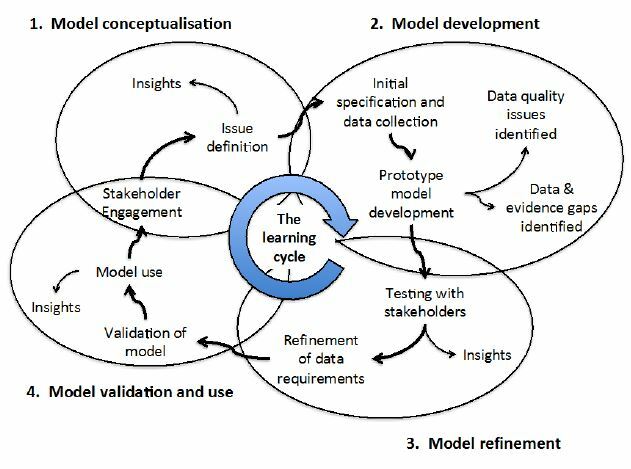 Once we’ve agreed the focus and scope of a model there’s the task of gathering the data and intelligence to build what we often describe as a prototype model. 3. Refinement of the model comes through testing it out with people who know the local system from the inside. 4. By the final stage of the process the level of confidence that can be placed in the model outputs will have become clear, which may lead to model refinement and improvements in data quality – but most importantly by this stage stakeholders will have assessed how the model building process has clarified their direction of travel and provided some outputs that can be used in their planning. If you like a challenge and want to explore how system dynamics differs from spreadsheet modelling why not try the ice-breaker below. If you want further information about system dynamics modelling then contact either Mark Gregson or Peter Lacey. An increase in waiting time can feedback to reduce referral rates as GPs adopt more of a wait and see approach – this is a classic balancing loop. An increase in people waiting which increases the risk of urgent treatment, which further reduces treatment capacity for people on the waiting list – this is a classic reinforcing loop and can, without any balancing loops, lead to a run-away system. This simple simulation is provided below. You can explore the structure and dynamic behaviour over time to get a feel for what a System Dynamics model looks like. We’ve also set a challenge, purely for learning and education purposes. If you have understood how this model works by exploring the storyline and using the different assumptions to obtain model outputs, and you think you can reproduce part of all of it using a spreadsheet we’d like to hear from you. Please e-mail Peter with your findings and perhaps comment on our blog.